Imagine an America where the epitome of fine cooking could be found at county fairs, and almost every fancy restaurant was “Continental.” That’s the foodscape I waded into at the beginning of my food-writing career. Oh, murmurs of raddichio and reduction sauces could be heard along the coasts, but the Midwest where I teethed as a restaurant critic was still the land of Jell-O and meatloaf. That was beginning to change in 1982 when I began making my daily bread by eating it. Travelled and savvy home cooks wanted more glamor than a pot roast could provide, and that’s where I came in. Those were the days of duck ala orange, roast cornish hens, boeuf Bourguignonne and fettuccine Alfredo. Men seemed to be the early experimenters. In a typical day, a male ad rep would corner me in the newspaper cafeteria to talk paella pans or a circulation manager would hunt me to ground at my desk to give me his recipe for caviar dip. They all followed Julia Child and they all made Caesar salad tableside, with much ceremony, for their friends. Caesar salad was a litmus test back then. Did you coddle your egg for exactly one minute? Did your rub the bowl with garlic, which you then tossed out? Did you use anchovies or did you chicken out? Men who considered themselves serious amateur cooks had large, maitre’d sized wooden bowls they bought expressly for this purpose. The pretentious rigamarole eventually dampened my enthusiasm for Caesar salad, and the raw egg scare killed it off. Remember in 1984 when scientists reported eggs in utero could be contaminated with salmonella right through the shell? No one, least of all me, wanted to look at another Caesar. 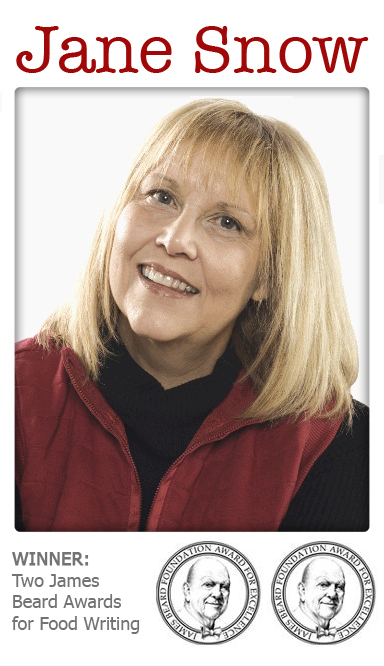 Then last month Jan C. mentioned ordering Caesar salad at Ken Stewart’s Lodge on her birthday. Remember that Mailbag item? I had to have some. Absence had made my heart grow fonder. I frantically searched for the right recipe. I looked in all my Julia Childs, James Beards, a James Villas and my New York Times Cookbook. The old classics failed me. 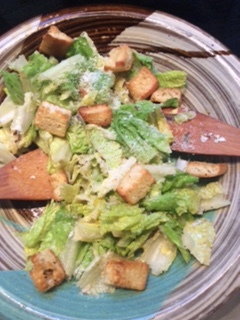 Craig Claiborne’s recipe sounded almost right, so I had to use that as a template and jazz-cook my way to a genuine, pre-contemporary American cuisine Caesar salad. It was just as good as I remembered. Here you go. Sprinkle the salt in the bottom of a salad bowl — preferably wood — and rub it with the garlic, pressing it into the salt and all over the inside of the bowl. When most of the flavor has been pressed out, discard the garlic. Stir in mustard, lemon juice and Tabasco with a fork. Add anchovies and mash very well. Drizzle in olive oil, beating until the salt has dissolved and the mixture is blended. With your hands, wring off the top tired inch or so of the romaine leaves. Separate leaves, wash and line up on dish towels. Roll up the towels like a burrito. Refrigerate until needed. When ready to dine, tear leaves into bite-sized pieces and add to the salad bowl. Sprinkle with Parmesan and break the egg over the salad. Toss very well. Scatter croutons over the salad and serve. Makes 6 servings. Cut bread or buns into 1-inch pieces, slicing off a very thin layer of the top and bottom crust if using buns. Brush the cut surfaces with olive oil. Spread in a single layer on a baking sheet. Bake in a preheated, 400-degree oven until golden brown. Makes about 36 croutons. Store any unused croutons in a zipper-lock plastic bag. Frozen pizza (my birthday dinner), sugar-free brownies; chicken thighs in white wine roasted atop green onions, carrots and thyme branches with white wine, roasted beets. A dry hamburger and frozen-tasting french fries at Beef O’Brady’s in Wadsworth; a Superfoods Salad (lentils, quinoa, walnuts, squash, dried cranberries, tomatoes) at Aladdin’s in Montrose; fried rice with chicken, pork and shrimp from Chin’s in Akron; another Superfoods Salad (loved it) and spicy beef kafta roll (loved that, too) at Aladdin’s; pickled daikon radish, warm redskin peanuts, a mounded platter of Hunan fried chicken (bite-sized pieces of crisp, juicy meat showered with sliced fresh Szechuan peppers and cracked Szechuan peppercorns), Hunan lamb (bone-in chunks of lamb with translucent cooked daikon radish, seasoned with cumin and five-spice powder, from Mingle restaurant in Flushing, N.Y.’s Chinatown; a Western omelet and coffee at Magna restaurant in Flushing; chicken breast over polenta with balsamic cream sauce, lentil salad with dried cranberries, French roll and cheese, mango cheesecake and Champagne aboard an AirFrance flight; a Camembert and ham sandwich at Gare de Lyon in Paris; a fennel salad and warm pastry-wrapped Camembert cheese, lamb shanks and sweet carrots braised in red wine, boiled baby potatoes, and a platter of cheeses (Morbier, tomme, Ste. Marcelin, Cantal jeune) with a local red wine at my friend Linda’s house in Homps, France. I was just reading your newsletter about green bean recipes. Not sure if you have a palate for S.E. Asian flavors, but one can easily substitute green beans for wing beans in this recipe for an entirely new way to eat green beans. Substituting green beans (or cucumber) for green papaya in the classic som tam salad recipe is also very common at food stalls here in Bangkok. If using fresh coconut flesh, cut it into strips and dry roast in a pan until golden brown, turning frequently. Slice the shallots very finely. Roughly crush or chop the roasted peanuts — you are aiming for crunch so do not chop too finely. Heat the vegetable oil in a skillet over medium heat and fry the shallot slices until golden brown and slightly crispy. Remove from the oil and drain on kitchen paper. Fry the chilies in the oil until dark. Drain on kitchen paper. Cut the peeled boiled eggs into quarters, lengthwise. Remove the veins from the prawns. Cut the ends off the beans, then blanche whole in salted boiling water for 30 seconds. Immediately plunge the beans into an ice-cold water bath. When completely cool, slice width-wise into 1/4-inch lengths. Heat the coconut milk in a frying pan until boiling. Add the prawns and cook until pink. Remove from the heat and add the tamarind paste, palm sugar, roasted chili paste, lime juice, fish sauce, peanuts (and roasted coconut flesh, if using.) Mix well. Now add the wing bean slices and mix again. Plate up and garnish with the egg slices, fried shallots and roasted whole chilies. Enjoy with plain steamed jasmine rice and a variety of other dishes. Pork or Chicken Wing Bean Salad: This dish may also be made with minced pork or chicken, using the pork or chicken either to complement the prawns or as a substitute for them.